Sailors stand watch to look for obstructions in path of vessel, measure water depth, turn wheel on bridge, or use emergency equipment as directed by captain, mate or pilot. Break out, rig, overhaul and store cargo-handling gear, stationary rigging and running gear, and perform a variety of maintenance tasks. Stand watch in ship's bow or bridge to look for obstructions or to locate navigational aids such as buoys and lighthouses. Alert deck officers when other vessels, navigation marks or hazards are sighted. Load or unload cargo to and from vessel and secure it. Steer ship under the direction of commander or navigating officer, following designated course, or direct helmsmen to steer. Stand by wheel when ship is on automatic pilot, and verify accuracy of course using magnetic compass. 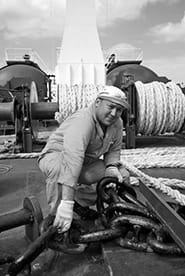 Handle ropes, wire mooring lines, gangways and ladders when the ship is berthing and unberthing. Stand gangway watches to prevent unauthorized persons from boarding ship when in port. Operate, maintain and repair ship and deck equipment and appliances (e.g. winches, cranes, derricks, cargo gear, rigging, and lifesaving and firefighting devices). Remove rust, treat and paint ship's sides and structures, and assist in maintaining and repairing ship's engines and mechanical equipment. Overhaul lifeboats and lifeboat gear, lower or raise lifeboats with winches or falls, and man lifeboats in emergencies. Maintain cleanliness of decks and structures, and clean ship's fresh water, ballast and oil tanks and cargo compartment. Set and strike ship's flag. Distinguish various types of anchors used in maritime transport operations according to the type of vessel, port characteristics and regulatory guidelines. Clean the ship's deck by sweeping and washing it thoroughly. Remove superfluous salt and water to avoid oxidation. Anchor ships to the port according to the type of vessel. Watch for navigation aids (lighthouses and buoys), obstructions, and other vessels that may be encountered. Interpret navigation aids, communicate information, and take orders from the captain. Safely navigate vessel in and out of port; communicate and cooperate with captain and ship's crew; operate vessel communication and navigation instruments; communicate with other vessels and harbour control centre. Follow standard procedures to unmoor vessels. Manage communication between the ship and the shore. Handle a wide assortment of deck equipment, including waterproof marine doors, hatches, winches, pumps, cleats, fairleads, portlights, shackles, swivels, tank top covers, anchors, and bollards. Prepare and organise equipment in the required locations and quantity on board a vessel. Clean engine rooms and vessel components using appropriate cleaning materials; ensure compliance with environmental regulations. Follow standard procedures to moor vessels. Manage communication between the ship and the shore. Safely guide a ship into a dock and anchor it. Assist during anchoring operations; operate equipment and assist in anchor manoeuvres. Use rope to secure and untie the ship before departure or upon arrival. Prepare lifeboats in ships before departure, ensure full functionality in case of emergency, follow regulatory instructions for lifesaving boats. Operate traditional water depth measuring equipment e.g. weights on a line, and traditional techniques for measuring the depth of water, particularly along coastlines and near harbours. Operate technological equipment to measure the ocean's depth. Calculate and interpret results, and communicate them to management. Understand and apply various methods of firefighting and various types and classes of fire extinguishing equipment. Detect and remove rust using primers and sealants; paint vessel decks to fend off oxidation process.